Best Yoga bolster is a yoga accessory that helps to enhance yoga practice where bodies are supported completely. 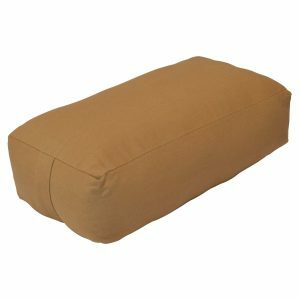 If you hate to practice yoga moves against a hard, cold floor then you should buy the best yoga bolster. This yoga equipment will support your body and solve all discomfort while doing different yoga moves. In yoga practice, it is important to keep our joints relaxed and open, so that we don’t need to use muscular energy for holding ourselves up. For this reason tools like Bolsters are essential for Restorative Yoga. If you want to get full benefits from yoga practice then you must get some yoga equipment like blanket, yoga mat, yoga swing, eyebags, straps, blocks and Bolsters to do your yoga practice without any problem. This article is about Best Yoga Bolsters Reviews. So, we will only focus on yoga bolsters. But getting the perfect yoga bolster is probably tedious. So, we have provided the top 10 list of best yoga bolsters that will make your buying best yoga bolsters much easier and better. Hugger Mugger is the best Yoga Bolster Brand founded in Salt Lake City in 1986. It is one of the leading and longest established companies in the yoga accessories and props business. The Hugger Mugger company’s stated goal is to produce innovative and high-quality products specifically yoga accessories like yoga bolster. This Hugger Mugger Standard Choice Yoga Bolster is a popular and well-made yoga bolster. It is an ideal prop for Supta Virasana, sitting poses, and Virasana. This top-rated yoga bolster has generous size is very helpful for great stretching. This yoga bolster offers great comfort and support. It is very firm and sturdy. Hugger Mugger Yoga Bolster is very popular in many yoga studios. This yoga bolster is recommend by many famous yoga instructors too. Always make sure that you only use cold water and air dry to avoid shrinking, when washing this bolster’s removable cover. In my opinion the best Yoga bolster for 2019 is the Hugger Mugger Yoga Bolster. This MAX Support Deluxe Yoga Bolster is sturdy and firm enough to support your body. When you use this bolster, It will not flatten. 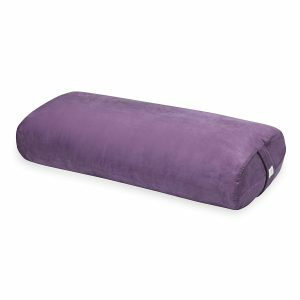 This best yoga bolster is perfect for restorative poses and soft enough to make you comfortable whenever you use it. This bolster also helps in relieving back pain. So, It is perfect for those people who have back problem. Let’s talk about its materials. 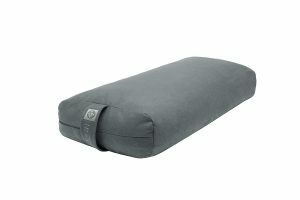 The cover of MAX Support Deluxe Yoga Bolster is made of high-quality materials. You can wash its cover. The weight is heavy which is also great. This yoga bolster is perfect for relaxation and stretching poses. It will help you to get into some difficult positions that seemed impossible with other bolsters. You can also get great colors like Blue, Green, Purple, and Black. This attractive bolster comes in great colors including Purple, Black, Sage, and Orange peel. 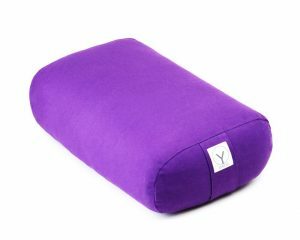 The YogaAccessories Supportive Rectangular Cotton Yoga Bolster is very sturdy too. The size of this yoga bolster is perfect; not too big, not too small. It is designed with high-quality materials. For easy handling, it comes with a handle. It has a zipper so that you can easily remove the cover to wash. This bolster is durable enough and great for restorative poses. It is comfortable too. 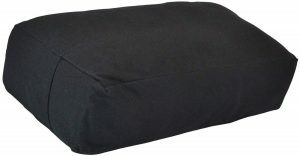 The fabric of this YogaAccessories Supportive Rectangular Cotton Yoga Bolster is soft but sturdy. You do not need to worry about getting another yoga bolster anytime soon. This Blue Dove Yoga Bolster is robust. It is a high-quality yoga bolster and is very solid. It’s support is also elegant. It’s great for practicing different Yoga poses. You can even sit on it when you meditate. It is available in beautiful colors including Dark Blue, Aubergine and Orange Print, Black and white print. Blue Dove Yoga Bolster is also a strong and well-padded Bolster. This best yoga bolster will help you stretch and practice different less extreme stretches. This bolster support is a great gift idea for anyone in Yoga. 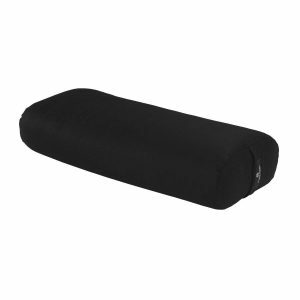 This Gaiam yoga bolster helps to reduce back pain while stretching. It is also convenient to use in different yoga poses. The cover is very soft and smooth. It is also made of high quality materials. The lid is removable and easy to clean. The cover is machine washable. This yoga bolster does not get flatten after excessive use. 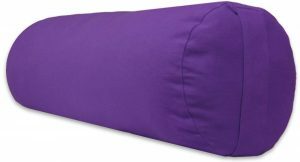 This best yoga bolster pillow is also great if used as a meditation cushion. Even the fabric is beautiful. It also comes with a handle for easy management. When practicing yoga positions that require kneeling, it provides great support for the knees. This yoga pillow provides adequate support for the knee and back. YogaAccessories Pranayama Cotton Yoga Bolster does not flatten even when excessive pressure is applied to it. It is available in attractive colors including purple, blue, black, off-white, and pecan brown. It has the right firmness. It is also light. This yoga bolster pillow is made of high quality materials and you do not have to think about replacing your bolster at any time. This is a perfect gift idea for anyone who is actively involved in Yoga. The cover is washable. The pillow is also thick. Gayo 100% Organic Cotton Yoga Bolster is convenient to use. It is also versatile, you can also use it as a meditation cushion. The size and weight of this bolster are perfect for travel. This Gayo Yoga Bolster cover is removable and facilitates washing. The cushion is also robust and compact. It is hard and does not flatten even after applying excessive pressure. It is also perfect for restorative poses. This Bolster pillow is also excellent for stretching. It does not come with a strong smell out of the box. This bolster is also durable. The yoga bolster of Manduka is robust and well done. It is also very convenient to use. It is soft and provides great support. this Best Yoga Pillow is also light. You can kneel comfortably and It has excellent padding too. The lid is also removable for washing. It is machine washable. You can stretch on this pillow. This support is also durable and comes with a single handle for easy handling. The fabric is beautiful and very attractive. This best yoga cushion is very durable and provides great support for relaxation. It also helps in all types of stretching. It is robust and made of high quality material. YogaDirect Supportive Rectangular Cotton Yoga Bolster is available in attractive colors including russet, sage, and maroon. The cover is washable because the cover has a zipper. This support is also perfect for different restoration techniques. It has a strong smell outside the box, but the smell quickly dissipates. The handle makes it easier to handle. This yoga pillow is also best for lower back pain relief. This best yoga pillow is solid and supportive. It is also large enough to support all body types. This pillow by YogaAccessories is great for regenerating poses and also alleviates back pain. It comes with a handle that makes it convenient to carry. Do not crush when you put your whole body. The fabric is beautiful and comfortable to use. It is also well stitched. The embroidery at the end makes it even more attractive. It’s also a great gift idea for someone who practices a lot of Yoga.